i read this post the other day, about the pervasiveness of the boring blog, which got me thinking about whether my little corner of the internet has any real worth, about whether anything i’m doing is original. here’s where i landed: very few things are truly original these days. what is original about something – be it a recipe, or a moodboard, or a story – is that its yours. that it’s told in your own voice, which is a voice no one but you can convey. 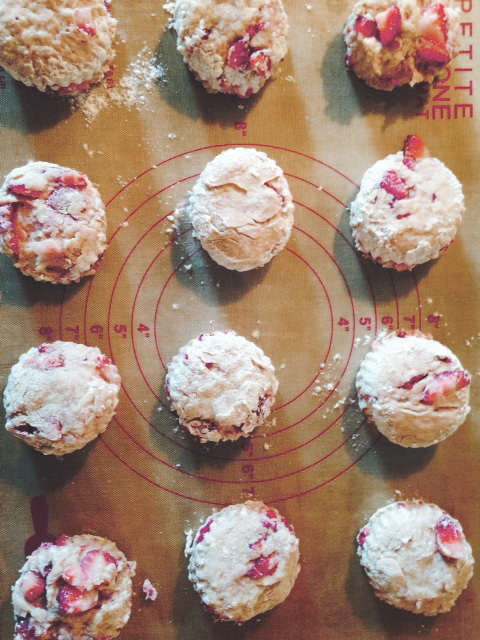 take, for example, the above recipe for strawberry scones. i riffed off this one, from annie’s eats. for all intents and purposes, it’s annie’s recipe, not mine. but when i made it, i added vanilla. i squeezed a bit of extra lemon juice into my batter instead of just adding zest. i used my hands to cut my butter into the flour mixture, instead of putting it into the food processor (a tip my mother taught me long ago). do those few things make it “mine enough” to warrant a post? i suppose that’s up for debate. what i do know is that i made this recipe, and made it my own. and it was delicious, so i’d like to share it with you. it’s as simple as that. guess what? they’re not. scones are actually uber SIMPLE to make. which is what makes them so magical. they’re a breakfast/brunch standby, and you can whip them up in under 30 minutes. generally speaking, it’s likely that you already have all the ingredients you need on hand, which is always nice. these ones, which are spiced with a hint of lemon zest and feature fresh strawberries, are like a pop of spring in your mouth, which is a good thing on a sunny day when it feels like mother nature is finally letting go of her grasp on the warmer weather we were promised almost a month ago. in a small bowl, whisk together your yogurt, milk, vanilla extract, lemon zest, and lemon juice. in a larger bowl, mix your dry ingredients. set aside, and cut up your butter. i like to cut mine into sliced (the way you’d slice up cheese), then quarter those slices. add your butter to dry ingredients. with clean, dry hands, begin to smush the little bits of butter into the flour. you can use a pastry cutter, or a food processor, or even two forks, to do this, but i find using your hands is a) most effective and b) most relaxing. transfer your dough to a well-floured surface (i like to use these cutting board mats), and pat it down to flatten a bit. if you’d like, you can shape your dough into a circle, and cut into wedges. i got these cute biscuit cutters at the williams sonoma outlet last year, so i always opt to put some nice fluting details on my scones when i can. what can i say? i’m fancy like that. anywho, you can basically shape your scones however you damn please, so long as you make them all somewhat equal to ensure even cooking. to bake, place your scones on a baking sheet lined with parchment paper (or silpat, if that’s your jam) for 13-15 minutes. they should be golden around the edges, and have risen considerably. 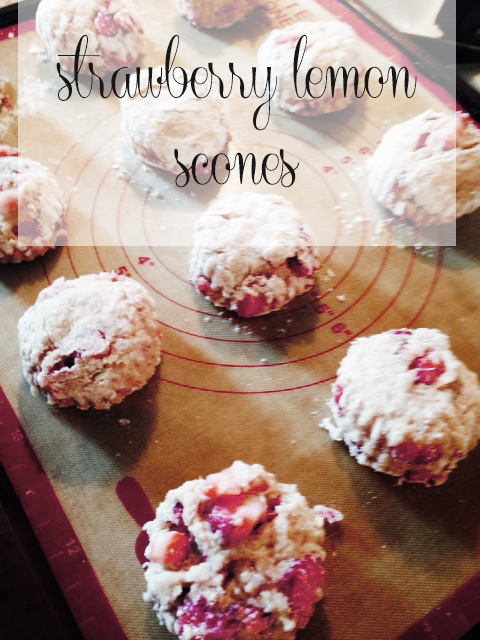 when your kitchen starts to smell like fruity spring goodness, they’re done. eat ’em as soon as you can, because sadly, the strawberries get a bit mushy after a day or so. eaten hot out of the oven, with a pat of butter, these are positively stuff your face delicious. happy eating! *i packaged most of mine up and dropped them off to my ladies at blackstones – my favorite hair salon in the city – as a thank you for prettifying me and giving me some serious blonde ambition the night before.